Fans of the perennial underperformers, the Bulls, are talking the talk in 2018. It is all about John Mitchell and his positive influence of the Bulls. They are going to play an attractive modern style of rugby, they are going to play winning rugby, they are going to play aggressive rugby. They are contenders for every title on offer in 2018. I guess they have actually produced on one of those promises, they do play aggressive rugby, but it has never been focussed aggression, it has always been of the old-style bully-boy intimidating type, and their opponents have not been intimidated by that kind of posturing. You have to walk-the-walk too, guys! Many words have been written and spoken about the arrival of John Mitchell. He will sort out the Bulls! 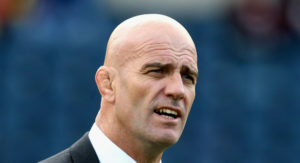 I have the greatest respect and admiration for John Mitchell as a rugby technician. Very few people can read and understand the technicalities of the game of rugby as well as John does. He is also a master tactician. John Mitchell is a student of the game, and he knows the game very very well. But he has had some problems as a coach. He started his coaching career as player/coach of Fraser Tech in England, back in 1995. Them in January 1996, when Murray Kidd was appointed coach of Ireland, he brought in Mitchell as technical adviser/forwards coach. That did not last long, just five months later, in May of that year he joined Sale Sharks, taking over from Paul Turner as head coach at the end of the 95/96 season. Mitchell was in charge of Sale until 1999, when there were “problems” and his contract was terminated. Mitchell also assisted Clive Woodward as forwards coach for England from 1997 to 2000. In late 2000 Mitchell returned home to New Zealand as the new head coach of the Chiefs in the Super 12. He took them to a sixth-place finish. A year later he was gone from the Chiefs outfit. In October 2001, Mitchell as appointed head coach of the All Blacks. Initially he had mixed success, amongst others, failing to win the Bledisloe in 2002, but getting it back from the Aussies in 2003. He then led the All Blacks to a third place in the 2003 Rugby World Cup. After losing to Australia in the semi-finals of the RWC, he was fired by NZ Rugby. The NZRU cited Mitchell’s difficult relationships with certain players, the media, and with sponsors as the main reasons for ending his contract, rather than the performance of the team. After leaving the All Blacks, Mitchell took over Waikato. In his first season in charge, Waikato were knocked out in the semi-finals of the NPC. In 2005, they failed to make the play-offs at all. Mitchell left Waikato at the end of 2005. In 2006, Mitchell took over the Western Force in their debut season in the expanded Super 14 competition. He lasted four years. After the 2010 season he was released by the Force. Once again, there was talk of strained relationships with players and administrators. Mitchell headed for South Africa where he took up a coaching job with the Golden Lions in the Currie Cup. In 2011, he was simultaneously appointed head coach of the Lions in the Super Rugby competition. 2011 was a successful year for Mitchell in the Currie Cup. His team beat the Sharks 42–16 in an epic final. On 22 June 2012, he was suspended by the Lions, after complaints from players regarding the manner in which they were treated by Mitchell. Certain internal disciplinary charges were brought against him by the Lions. In November of the same year, he was found not guilty of all charges against him and reinstated as Lions head coach. However, on 23 November 2012, he quit as coach, to take on a role as a technical adviser at the Lions. That did not last long, on the 28 November 2012, after two seasons with the Lions, Mitchell accepted a position at Sale Sharks in the UK. That again, did not last long. Just a month, in fact. On 29th December 2012, Sale announced Mitchell had returned to South Africa citing “personal reasons”. In 2013 Mitchell claimed he was offered the job to coach Scotland, but that he had turned down the offer. On September 11, 2013, Mitchell was named head coach of UKZN in the South African Varsity Cup. Following the 2015 Rugby World Cup, Mitchell applied for the vacant head coach position of the England national team, but the job went to Eddie Jones. As Jones had accepted the job of coaching the Stormers in Cape Town, the Cape based franchise were left in a bit of a hole, desperately searching for a replacement. Mitchell’s name was in the pot, but following supposed interventions by Kevin de Klerk of the Lions, and a number of people associated with SA Rugby’s Executive, the Stormers walked away from negotiations. Rumours had it that his relationships with players and administrators had been at the root of the problem. Mitchell’s time in charge was one of somewhat mixed results. Wins over an Argentinean XV, Canada, and Chile were off-set by first ever losses to Brazil and Uruguay. Then the Eagles lost to Italy, but beat Russia a week later. Losses to Romania, Tonga, and the Maori All Blacks followed. In March 2017, Mitchell led the United States to their first ever Americas Rugby Championship title, with victories over Brazil (51–3), Canada (51–34), Chile (57–9) and Uruguay (29–23) heading into the final week. The final week saw them draw with the Argentinean XV. A bonus point try in overtime levelled the score and saw the United States finish with 22 points on the log to Argentina’s 21 and take thus the trophy..
Once again, several problems had emerged with Mitchell’s coaching style. Perhaps the biggest problems was that Mitchell refused to relocate to the United States, attempting to coach the U.S. national team from his home in South Africa. Mitchell also refused to assist with the development of American rugby coaches, which had been integral to the national coach’s job description. Once again, there was talk of relationship problems with players and administrators. It was announced in late May 2017 that Mitchell would leave the USA Eagles after their 2019 Rugby World Cup Qualifiers play-offs against Canada in July. His last four-match campaign as the Eagles head coach saw them win just one game, with two losses and a draw. John Mitcghell is now the Bulls’ head coach. I give you the above record as something of a cautionary note. John Mitchell’s track record as a coach is patchy, at best. I will add that, based on his record, he is clearly not a consistent, winning coach! I have also wondered whether his disciplinarian approach, together with his lack of man-management skills, will be the right one for the Bulls. We shall simply have to wait and see. Turning the Bulls into winners will take some doing. In 2017, they lost more than a heap of rugby matches. The myth of Fortress Loftus has finally been shattered, with the remaining battlements and fortifications scattered to the four corners of the rugby world. The previously loyal crowds have abandoned their team and Loftus Versveld is often as empty as some of the Aussie stadia. The Bulls lost to the Sunwolves and the Kings, and then the Stormers, Cheetahs, Blues, Chiefs, Crusaders, Highlanders, Lions, and Hurricanes too. They managed to beat the Sunwolves, the Jaguares, the Cheetahs and, somehow, the Sharks. Four wins in a season is not a great record for a team that likes to tell everyone that they are the only South African team to have won the Super Rugby trophy. Unfortunately, history lessons are great for preserving facts and studying what went right and wrong, but you have to learn from history and apply the lessons you learn! Nostalgic reminiscing around the braai fire is a wonderful pastime, but it avoids the realities of today. “When we won the Cup” is simply a defence against the string of woeful performances and poor rugby produced by a team that should be so much better. It is denial rather than remedial. The Bull’s much vaunted scrummaging power is historical, much as the myth of the Jaguares power scrum. When you have the third worst scrum success rate in the entire competition, you are close to being called crap! Add in the fourth worst try scoring record, despite a backline replete with current Springboks, and a pitiful defensive record, and you have a team that is in serious need of remedial measures. The 2018 fixture list has not been kind! The Bulls start with home fixtures, usually a bit of good luck, expect that this year they face the Hurricanes, followed by the Lions, at Loftus. Next, they are away to the Reds, Chiefs and the Crusaders before heading back home to host the Stormers. 14 days later they are in Durban against the Sharks, followed by home games against the Rebels and Highlanders. Then it is off to Newlands for the return game against the Stormers, before they host the Sharks and then the Brumbies back at Loftus. They close their regular season with away trips to the Sunwolves and Lions either side of a home fixture with the Jaguares. New signings do not really stir too much excitement. Tim Agaba comes from the SA Sevens squad; Marnitz Boshoff, the journeyman flyhalf considered superfluous to needs at the Lions, returns from Connacht; Thembelani Bholi, and Dayan van der Westhuizen both joined from the Kings; Frans van Wyk arrived from the Stormers; and Jano Venter signed on from the Lions. I will watch John Mitchell’s work with his squad with interest. Will the Bulls accept his methods, or will we see yet another implosion as has marked most of Mitchell’s coaching stints? Previous articleSuper Rugby Team Previews!